Here's a view of the center of our world; Fish Street and The Wharf intersect in the upper middle of this picture. Our lodgings are in the white building; center. Just to the left of that is the Sloop, a watering hole dating back to the Middle Ages (1312, to be exact). We have breakfasts in the Sloop, which are wonderful and satisfying. Isaac loves the toast points, handed to us on a small metal rack, dripping in butter. Here Isaac is looking over the waters of the harbor, towards the lighthouse. It's cool in the morning, and we're dressed as so not to be bothered by it. But it'll be tee-shirt-warm in a few hours. 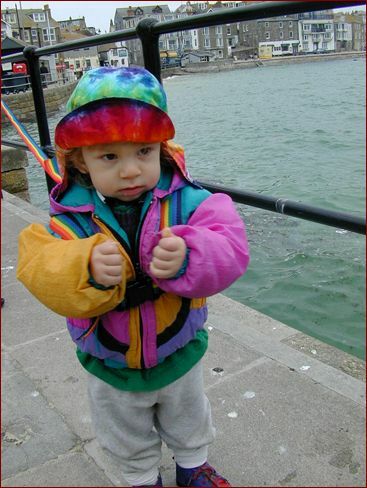 Isaac is wearing a rainbow-colored safety harness that I stiched together for him back in San Francisco. Here's a better view of the boy, harness, and matching rainbow hat. I have no idea what he's signing. It might be how a boy with cold hands signs "more". This is what Isaac was seeing. The Sloop is behind us, and the Wharf stretches into the distance. To the left are the working fleet: fishing boats which ply the waters. At right is the promenade, which continues along the water's edge until the rescue squad building. There it becomes residential, and one walking along is treated to the sight of tiny houses, tinier gardens, and beautifully tended flowers and vegetables. Here's a close-up of the Sloop, with its ever-present coterie. It's loud, it's boisterous, and damn!, it's the place to be. You can't see it, but I'm probably eating a pastie (the local version of a Jamaican hand-pie, filled with meats, cheeses, and/or veggies). I might be eating the freshly-made ice cream, chock full of the local berries. This was a great trip for snacking. We were mindful of Mad Cow Disease, and eschewed beef products - except for two mistakes, one a pastie and the other a chile con carne in London. Doh! Here's another view of the intersection of Fish Street and The Wharf. This time the tide has gone out a bit, and I'm standing on the sand of the harbor floor. 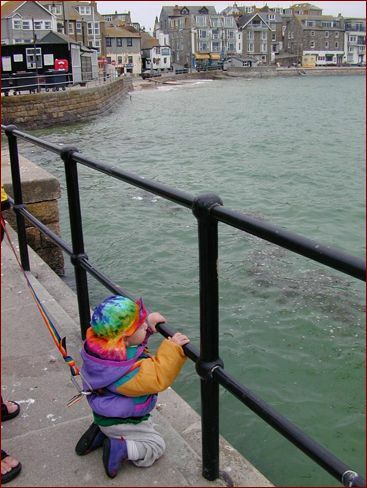 With the exception of the Bay of Fundy, I believe that St. Ives has the highest difference between low and high tide. Here's one of the restaurants on The Wharf, the Hobbler's House. I remember this best because of the delicious roast duck and cherries. The interior is old, dark wood. Cozy and tasty. It's good to be in the middle of everything; this was about a minute's walk from our cottage. The Wharf has some nightlife too. 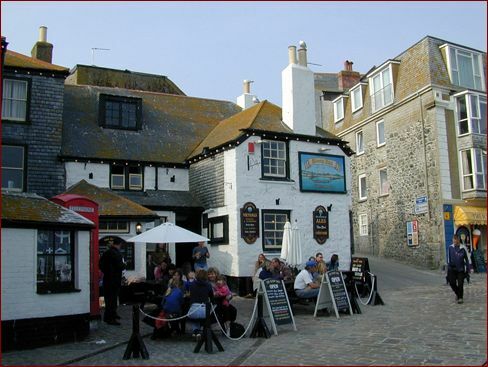 Pubs are a favorite way for the locals and visitors to spend some time, but not for us. We did lots of walking around, enjoying the salty sea air. Frequently we'd stop by the penny arcade on The Wharf. 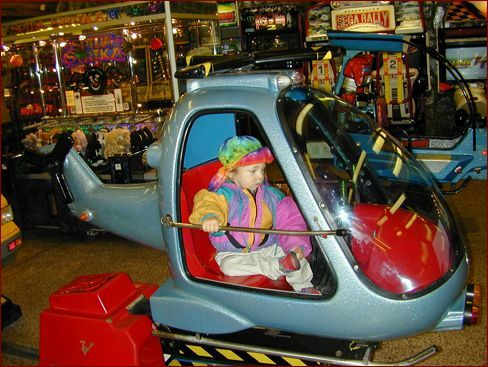 Isaac was scared of some of the more noisy, lighted rides, but he loved this helicopter and an old train ride. There was a talking fortune-telling doll which had a screeching laugh. It really spooked Isaac for a few days; the rest of us it just annoyed. You could hear that thing halfway up and down the promenade. He screwed up his courage and worked on getting closer to it each day. He was so proud of himself when he could walk up to it and see that it was only another mechanical contraption. 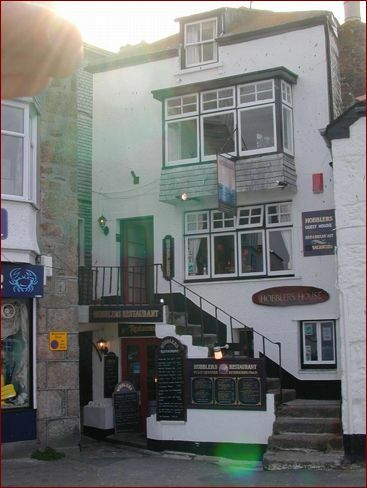 There's more to St. Ives than just The Wharf. It's time to take a walkabout.